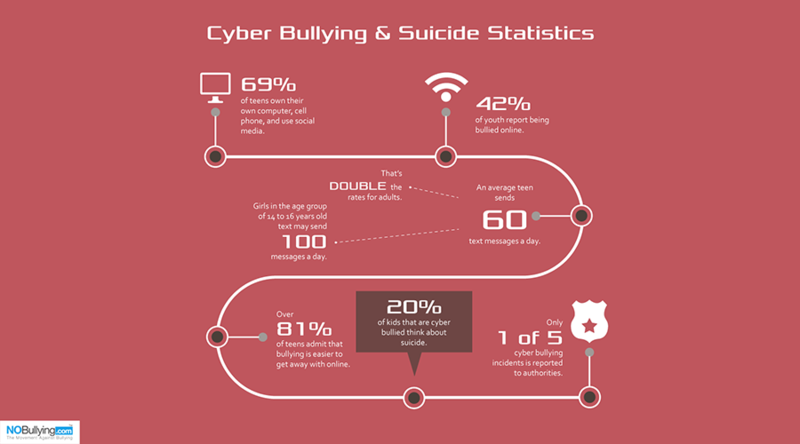 Did you know that nearly 40% of kids and teens say they have been cyberbullied? Or that only 20% of incidents are ever reported to the authorities? Did you know that 20% of kids who are cyberbullied have suicidal thoughts? Neither do most parents. And with suicide rates up 50% for 10-14 year olds alone in the last 30 years, it’s time for parents to start paying closer attention to their children’s online behavior. Cyberbullying is when someone repeatedly threatens, harasses, mistreats, or makes fun of another person (on purpose) online or while using cell phones or other electronic devices. It’s a growing epidemic that is leading to increased depression and suicide in our youth. By understanding what it is and how to prevent it, society can bring an end to online bullying and give our children a chance to live the lives they deserve. Changes in how they use their technology: As parents, you can gauge how often your kids are playing on their phones, tablets or computers. Raise your hand if you’ve even had to restrict online time! So, when you find your daughter holed up in her room reading her Chemistry book rather than chatting on Facebook after dinner, she may be sending you a signal. Changes in technology usage – whether it be a lot of phone time to a little or vice versa – are a big indicator that your child is experiencing online bullying. They may be afraid to see what’s being written about them on social media or they may feel a need to constantly defend themselves to their peers. Regardless, if you notice a major in change, don’t be afraid to speak up and ask if everything is okay. Only 1 in 10 kids will actually tell their parents about cyberbullying, so it’s up to you to start the conversation in most cases. Anxiousness when receiving a text, email or chat alert: If the *ding* of a message once made your son jump for joy in hopes that the girl he liked responded to his post now makes him jump and run for the hills – he may be cyberbullied. Social media actually has an addictive nature – giving people the urge to check it on more-than-regular basis. So, if your child suddenly looks stressed and doesn’t automatically reach for the phone, there could be an underlying problem. Being secretive about their online activity: While kids aren’t always the most open about discussing their private lives, most parents would agree that they find it hard to resist sharing some juicy gossip or new-fangled device they came across online. Who’s ever gotten the ‘Mom, isn’t this cool? Man, my birthday is right around the corner’ *cough cough* Well, if your son or daughter is now nervous when you come around their phone or quickly closes the webpage they were visiting, it may be an indicator of problems online. Whether it turns out to be bullying or some inappropriate content, it’s important that your children understand that – while you do respect their privacy – you also worry about their well-being and will be checking in from time to time. Mood swings: Kids are moody. They’re angsty. Their emotions dominate most of what they do in life. However, there are times when the moodiness turns into their regular demeanor and it’s these red flags that you should be aware of. Prolonged periods of anger, sadness or withdrawal are definite signals that something is wrong. Try your best not to feed into the emotion, but rather calmly address the change and see if you can dig out the root of the problem. You never know who could be causing these problems – and if it’s a cyberbully it’s best to catch the issue early on. Withdrawal from school and social activities: Kids are moody, but they’re also social. And when their social lives become dormant – or they actually resist doing anything with friends, sports or extracurriculars – you should take notice. Yes, teens are lazy and the thought of practicing for soccer for two hours after school may sound like the most painful thing on Earth. However, missing soccer practice, piano, their best friend’s birthday party, the school dance which they went to last year – it makes you wonder what could be wrong. It is very possible that your child has social anxiety over seeing certain people or are worried that if they attend any event that their cyberbullies will turn into real life bullies, which is something that – to them – is far worse than missing out on their favorite activities. Poor performance at school: Schoolwork can be a clear indicator of unhappiness in a child or teen. We engrain the importance of turning in homework and getting good grades, so if you learn that your daughter is no longer turning in her assignments or that your son if failing all of his subjects – it’s time to ask what’s wrong. No longer caring about school or actually purposefully doing wrong are often cries for help as your children are looking for anyway to get someone’s attention. With teen suicide rates on the rise, any indication that your child is unhappy is cause for further investigation. If you are able to find the root of the problem and stop it – especially if it’s cyberbullying – you are giving your child hope that things will get better and that he or she has a bright future ahead. Blocking certain accounts from social media or email: On the surface you may not know who exactly your child is talking to online. However, with tools like parental control software, you can actually see for yourself. If you notice that your son is blocking friends or classmates on their accounts, this could be a sign that he is being targeted by these peers. Software, such as FlexiSPY, give you the ability to step in and address a problem like online bullying head on before it gets too heavy for your child to handle. At first your child may be upset that you involved yourself, but when he or she realizes that your interference actually stopped the problem they will surely thank you in the longterm. Deleting social media accounts: Social media – Instagram, Facebook, Snapchat – is the most common method of communication amongst children, teens and young adults. It’s where they get their news and gossip. It’s where they express themselves and develop their identity. So, if your child suddenly deletes his or her account, you can be fairly certain that someone has made them feel uncomfortable or unsafe online. Again, Mom and Dad, don’t be afraid to ask why. Don’t be afraid to ruffle some feathers. Even if your child doesn’t speak about it with you right away, they know you are there and aware of the problem. And that may be exactly what they need to have the courage to speak up. Cyberbullying is a real issue in today’s society and one that truly affects our children and teens – and in many cases adults too! It’s our duty to protect our children and sometimes that means toeing the line between parent and friend. Knowing the signs of cyberbullying gives us the upperhand and in a truly viscious battle that is sadly taking the lives of many of our youth – far before their time. Don’t be afraid to intervene. Don’t be afraid to ask questions. And don’t be afraid to get some extra help when your son or daughter just won’t open up. Cyberbullying can be traumatizing and embarrassing, so be gently with your children when bringing it up. Tools like FlexiSPY make it easy for your to see exactly your child is talking to, what they are discussing and if you need to take action to protect him or her from the dangers of suicide or online abuse. We are here to help, 24/7 in fact, so don’t be afraid to contact us and bring peace of mind to your family. We understand that the digital age is hard. So, let us do the hard stuff. For more information on how to get your copy of FlexiSPY, visit www.flexispy.com today!